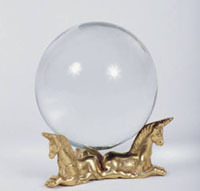 Enhance your next themed event with the addition of a fortune teller or mystic. 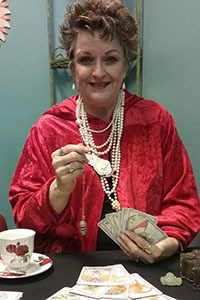 These unique and memorable entertainers can read palms, utilize the tarot or crystal ball for a fun filled indescribable evening. They are the hit of the evening and leave your guests wanting more. This "Mystic Druidess" is a pre-Atlantean Starseed of the Tuatha De Danann line, a spiritual oracle/healer of Eygyptian/ Delphic/ Nordic and Celtic traditions divining with Tarot, Palms, Runes, Numerology, Handwriting Analysis, and Dream Interpretation. 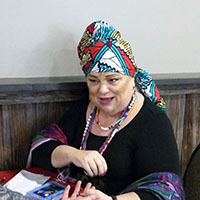 Let this entertaining fortune teller read your cards and look into her crystal ball to discover the truth about love, friendship, work, business, happiness and future. 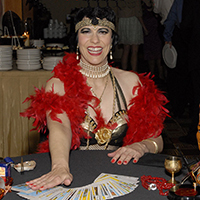 Her charismatic personality is guaranteed to bring a smile and add en element of mystery to your event. Pucker up! Our lip-print reader can read your personality characteristics, energy levels, emotions and more just from the smooch you present. 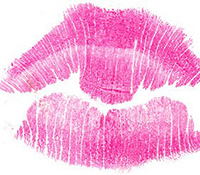 The lip prints are made by putting on lipstick and then 'kissing' or pressing lips to paper...it's the second most fun your guests will have with their lips during the evening.